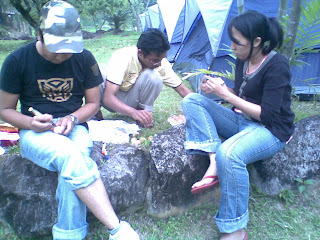 The weekend was spent by me,camping at Kem Rebutia in Gombak with my lively & lovely PMFP committee & fellow participants of our Leadership Camp.IT WAS AMAZING.Initially,I was apprehensive about it because although I am the Vice PM for the camp with Hisyam being my PM,the idea of camping(as I've never camped before in my life! )& when I heard from Fazirul a few days before the camp that we'll be going through a swamp in the forest(I know about the jungle trekking but I never thought that we have to go through a swamp(paya in Malay)!! ),it didn't exactly made me all that excited.I was more worried about it all. I still remember the time when Mak & Napz wish me goodbye in front of their house as I was hopping in my dad's car,they were like,'why I didn't seem excited? 'I was like...Cos' i'm not!I was having my period,PMS-ing & all... & the guys of PMFP have been telling me that the place is 'keras' & when someone is having their period,going through a muddy swamp & going in the jungle in that 'condition' doesn't fell very comfortable to me..huhuhu. 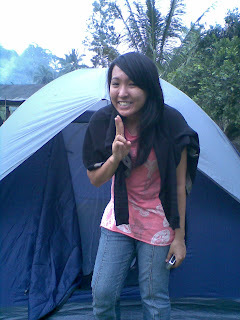 But,I was shocked to discover that I actually like camping & trekking in the jungle!! !It was so much fun albeit the muscle aches that I'm feeling now.Currently,both of my arms & hips hurts..I guess it's because we spent 6 hours jungle trekking(no joke!! !And we didn't stop for more than 30 mins or so at one place)..On day 2,we went in the jungle at 10.30 am & came back at the camp side at 5.30 pm!So during the weekend I did 4 things that I've never done before...1st:I went camping,2nd:I overcome my fear of heights,3rd:I did the flying fox(that was fun but the obstacles to get to the flying fox was damn scary & made me shake so bad! 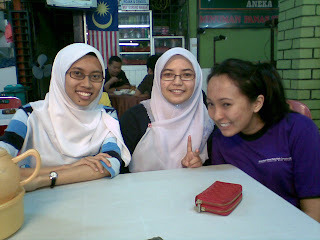 ),4th:I didn't wear any form of make up at all,no eyeliner,or concealer..nadaa! (only during the last day)& only bathe twice during the 3 days..hahaha. 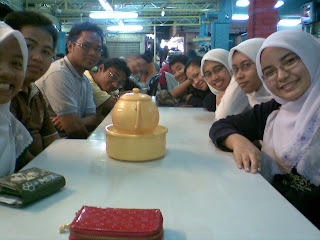 We left our faculty,with the rain pouring down profusely at about 3 something in the afternoon.The bus went the other way while I drove my dad's car with Hanna,Hani,Azie,Azila & Jasmine.In front of us was Hisyam in his car with Furkhan,Fazirul&Akmal.I followed Hisyam's car safely to the camp but I did manage to overtake him once or twice but being a guy,he has to always be in front& the fact that he drives a sports car & I was driving an MVP,he left us behind & arrived earlier than us...ciss! The first day started with the participants having some tea and then they were given their 'barang amanah(a thing that they have to take care with their life)' and they were given their camp to set up.I manage to set up the camp with Hanna! Yeay!! 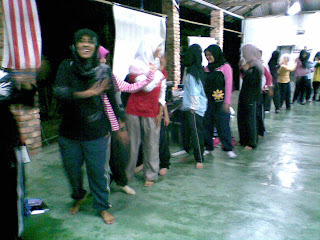 !After dinner,we did an ice breaking session. 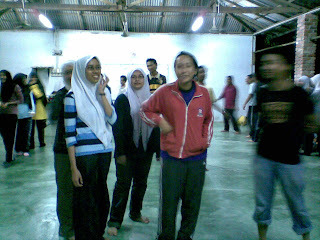 My & Azie's team,'Project Pop',won the best team because they manage to beat the other 4 teams during the games that they had to do.Afterwards,the participants were given a talk by the facilitators of the camp while the PMFP committe went out to the town nearby & had satay & lots of coffee cos' we know that we won't be sleeping tonite! Lots of jokes were cracked up by the guys..Believe me,I've been working with the guys for a year & they are the funnniest guys I've ever met!! !There's never a dull moment when there's Furkan & Fazirul around--they made a joke about a particular lecturer that made us all laugh so hard!! 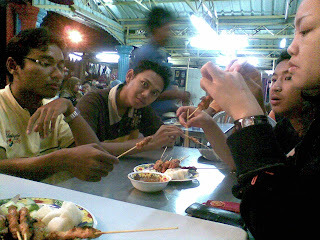 After satay & coffee & buying some provisions for the 'torturing' session for the participants.The torturing session went on for a few hours with some participants crying & most of them was chaterring through their teeth(because the camp side was very very cold at night & in the morning..).We,the committee had like only an hour of sleep afterwards at 4.30 am & had to wake up at 5.30 am. There's so much to blog about but I'll blog about it later during this week cos' there's assignments to do & tests to study for..Ayeyayay!! !And there's plenty of pics from the camp that I've to get from many people..It's boring to blog about this but having no pic of it..so toodles!!! "cikgu nampak ape yg awk buat kat belakang tu!"hahaha.. god....now i'm remembering how many times we laugh out loud during those 3 days..
or when Fazirul laugh like a person that's out of breath+wheezing because of furkan..semangat giler gelak! kelakar nak mampos si furkan!!!! 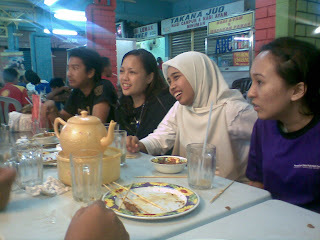 aq still tak paham nape korg sume gelak kat aq time tiru gaya furkan yg 1st tuh!! btul ja aq wat(in denial)!!!! 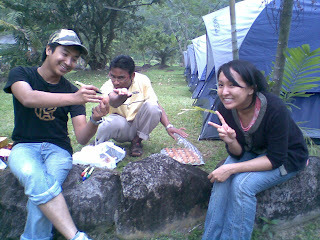 aq still ingat furkan punye muke time die wat gaya tuh & yg 'bang bang' tuh after ayat kat atas tuh..
first time camping. 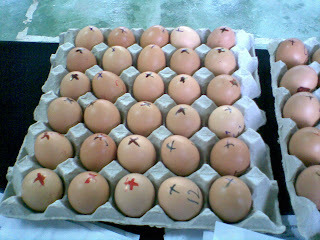 well, pray that they'll b many more to come! oh mannn sounds like real fun! 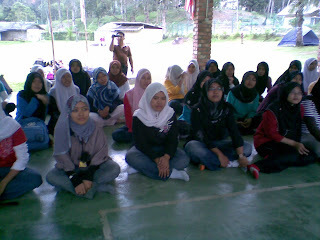 im glad u DID go to this camp for the first time. u should get some credit for SURVIVING!!! hahaha. 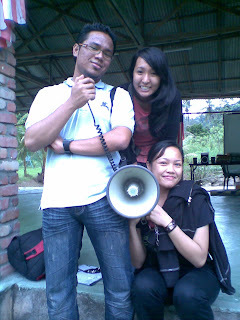 when i was about 2go..i couldn't help but remember what izzat&his friend along with u,a few years ago told me about if i ever went camping..that i would bring a heck load of stuff.. But i didn't really bring a lot! going in the jungle from 10.30am-5.30 pm!! !